Come Hack at Dorm Room Fund! Hey! I’m the Head of Engineering for Dorm Room Fund, a student-run venture fund that invests real money in startups started by student entrepreneurs. We’re backed by First Round, a venture fund that invests in companies like Uber, Square and Warby Parker. And we’re looking to grow our team of student engineers from 1 to >1! Working on the DRF Engineering team is a pretty unique opportunity. You get to hone your technical skills and work on real-world products that help people start companies, which is pretty awesome. We build with the latest and greatest, and own everything from design to deployment. 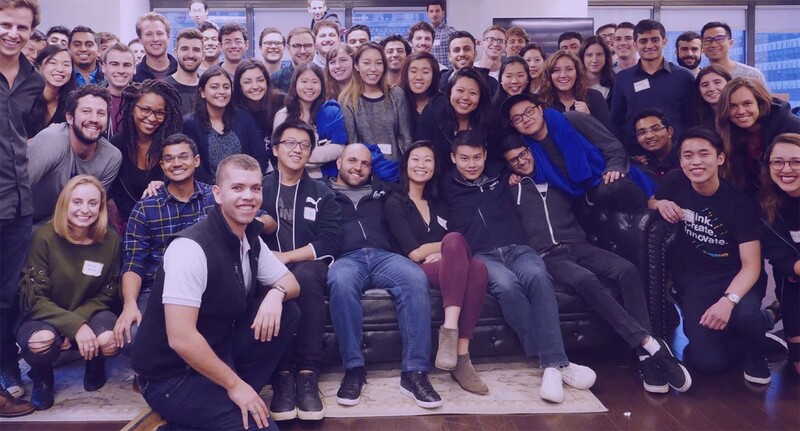 The best part is you get to do all this while learning from the inside what venture capital is like — something most engineers don’t get the chance to do. Over the years, we’ve built a ton of cool stuff. Keep reading to learn more, or go straight to the application below. We’re also looking to bring on some student investment partners, which you can learn more about here. One of the best examples of an existing DRF product is VoteCollector (or VC), our unified data store and voting platform. 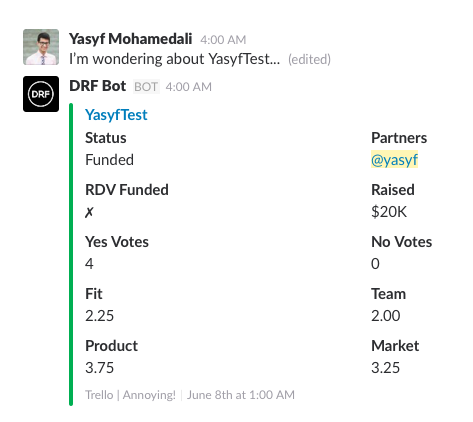 VC is built 100% in house, and adds a layer on top of Trello (which we use for tracking deal flow) which lets us collect and analyze both qualitative and quantitative information about how DRF partners are voting. We use this to look for patterns and call our bad habits. Of course, VC does so much more. What started out as a simple voting tracker is now a comprehensive platform for tracking companies. We can automatically monitor investment events, exciting news, announcements, and quarterly check-ins with companies both in our portfolio and out. We can sync meeting notes with the partners’ emails, and monitor their calendars for meetings with founders, helping them document the process. We can even collect background information on companies and founders to help our partners do diligence! Part of the job of the DRF engineering team is to make it easy for everyone else to experiment and move fast, so we’ve built out a comprehensive internal API that gives the whole organization programmatic access to all the data we’ve ever generated. We’re also big on magic, so we build a Slack bot which listens in on all our conversations and adds helpful contextual information on companies being discussed. DRF Bot also has quite a few fun easter eggs and useful integrations! Being on our team also gives you an awesome chance to play with new technologies. Engineers at DRF often rack up contributions to open-source projects, and we’ve even toyed with some deep learning to do crazy things like predict funding outcomes. We’re looking for world-class engineers with a passion for side projects (which are often how companies start). You should be excited about helping founders turn their dreams into reality, and be willing to experiment and learn the best tools for each job. We’re scrappy, unstructured, and often chaotic, but we also adhere to strict quality guidelines — DRF ❤s good code! If you’re down with uncertainty and building out what effectively is a student-run startup, we want to hear from you! A few other requirements. Actively hacking on cool side projects, alone or with friends! Submitting an application is pretty simple. We require three things: some basic info, a couple paragraphs telling us about yourself, and the world’s quickest coding challenge. All the details can be found in this repo. Looking forward, there are a million and one things we want to keep hacking on, from models to help automate our fund, to public-facing tools like VCWiz, a one-stop-shop for first-time founders seeking investors that we’re currently building out. Want to learn more about venture while building stuff with some of the best engineers around? Come join our team! Thanks to Dorm Room Fund.